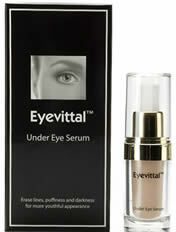 Eyevittal is an under-eye non surgical eye lift serum. When applied under the eye, it erases fine lines and dark circles. It works in minutes and yet lasts up to 10 hours, giving your skin a more noticeably smoother and younger look. Eyevittal is a dream look instant eye lift that has to be seen to be believed. Eyevittal is a light weight formula that works immediately by forming an invisable veil under the eye, tightening the skin's surface to reduce the appearance of puffiness, fine lines and dark circles in an instant. Eyevittal is easy to apply. Please stir well with the spatula provided so that all the ingredients are mixed together on clean dry skin. Apply a small amount onto your ring finger, working from the inner eye, following the eye contour outwards to the temple in a single stroke. Please keep still and ensure there is no facial movement while this dries. You will feel a firming sensation that will disappear after a short period of time. What Are the Benefits of Our Eye Lift Cream?